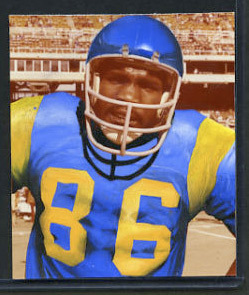 A great color palette is found on the 1977 Topps FB Match Print Photo of Charley Young of the Rams. It features vibrant blue, dirty-yet-bright yellow, sepia browns, and black. His posture is classic, too at its slight angle. Unfortunately this unique color palette is found only in the match print. The final printed card lacks the sepia colors. Though the design of the 1977 Topps football cards is pure classic sports card design.